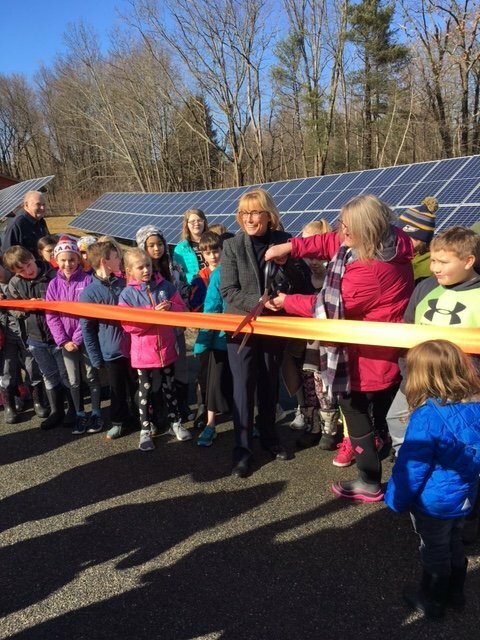 Senator Hassan attends ribbon-cutting ceremony for 216-panel solar array in Newfields. NEWFIELDS – Senator Maggie Hassan today joined in cutting the ribbon for a 216-panel solar array for the Town of Newfields, where she emphasized the importance of investing in innovative, renewable energy in order to build a more affordable and reliable clean energy future for New Hampshire and the country. The Senator also highlighted the importance of renewable energy to creating jobs and supporting the economy. Senator Hassan reintroduced legislation this week that would support the expansion of solar energy, helping lower energy bills for people and increasing the country’s energy independence, by providing recommendations on best practices for expanding net metering. Net metering allows consumers and businesses who generate some or all of their own electricity, particularly through wind and solar energy technology, to be compensated for the excess energy that they provide to the electric grid and other customers. The legislation would help provide valuable guidance and insight to states trying to establish or expand net metering program. Last week, Senator Hassan spoke on the Senate floor about the very real and harmful impacts of rising sea levels on New Hampshire’s economy and Seacoast, and the urgent need to take action to combat such harmful impacts of climate change.